Dr. Sabine Wilms and Liu Zuozhi (Dr. Liu Lihong's father) have collaborated to translate the transcripts of lectures by the "Virtuous Person Liu" (originally published as Liu Yousheng: Yan Jiang Lu ("Liu Yousheng, Record of Lectures"). In plain words and direct, occasionally quite radical messages, Master Liu communicates the wisdom he has gained in a lifetime of sincere practice and self-cultivation in the tradition of Wang Fengyi's system of five-element healing. The Confucian healing system presented by Liu Yousheng offers a profound example of the relevance of ancient medical theories. Confucius himself once emphasized, "He who by reanimating the Old can gain knowledge of the New is fit to be a teacher." 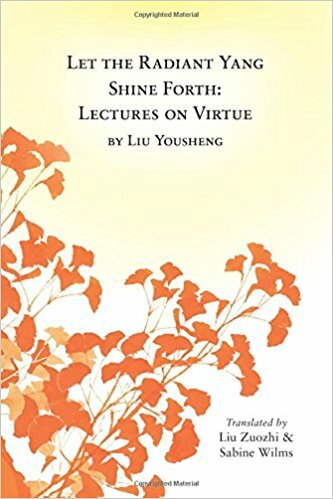 Liu Shanren's life, conducted in the midst of a rapidly industrializing and increasingly materialistic China, represents a most inspiring example of the radical teachings of surrender, self-responsibility and compassion transmitted by most of humanity's sages and saints. This book consists of Dr. Heiner Fruehauf's Introduction, 248 pages of translation, and two appendices on the "Precious Record of Physiology" and "The Heavenly Nature Affirmations."